It seems an almost impossible task, picking a wine (or two) to go with the myriad rich, savory, sweet and saucy components of the most hodge-podge holiday meal, Thanksgiving. Here are two sommeliers’ selections to help navigate the fray. Stephanie Cuadra of Terrestoria Wines splits her time as a wine importer living in Milan, Italy, and Salt Lake City. She’s especially attuned to the many working parts of pairing wine with a wide range of food. “Growing up in a Mexican family with Spanish roots, I always saw paella served alongside our turkey,” she says. Cuadra’s picks for the table have similar international flavors in mind. Noelia Bebelia Albariño ($25.99) from the Adega San Salvador de Soutomaior estate, is a mineral-forward white wine with bright acidity from the northwestern corner of Spain. “[It’s] a classic pairing for seafood specialties, yet also a delightful complement to white meats and ethnic dishes with a touch of spice,” Cuadra says. A food-friendly red, Quarta Generazione ($33.99) is made from aglianico del Vulture grapes grown on the slopes of extinct volcano Mount Vulture. “This is elegance you want to drink, and eat with,” Cuadra advises. “Rather than drowning out flavors of food, this wine puts a lovely accent on supper” with earthy spice, bright red cherry and vibrant acidity. Sonia Spadaro Mulone is the estate winemaker for Santa Maria La Nave located on Italy’s Mount Etna. A childhood dish she remembers growing up in Sicily is cudduruni, a savory focaccia-style folded crust pie filled with vegetables or sausage. “If I were preparing Thanksgiving dinner in Utah, I would serve this specialty from my hometown Lentini,” she says. “It reminds me of my childhood, when making cudduruni with my grandmother and mother on rainy afternoons was always a special treat.” Mulone’s Calmarossa ($70.99) made from nerello mascalese and nerello cappuccio grapes grown on the slope of Mount Etna is a spectacular wine for special occasions. Pago Restaurant Group owner and sommelier Scott Evans acknowledges the challenge of matching beverages with the typical holiday table’s bounty. “With Thanksgiving meals you want to think of wines that can transition well from yams to turkey leg,” he says. As his own restaurants reflect a wide range of food traditions, he’s used to bringing flexible choices to the table. 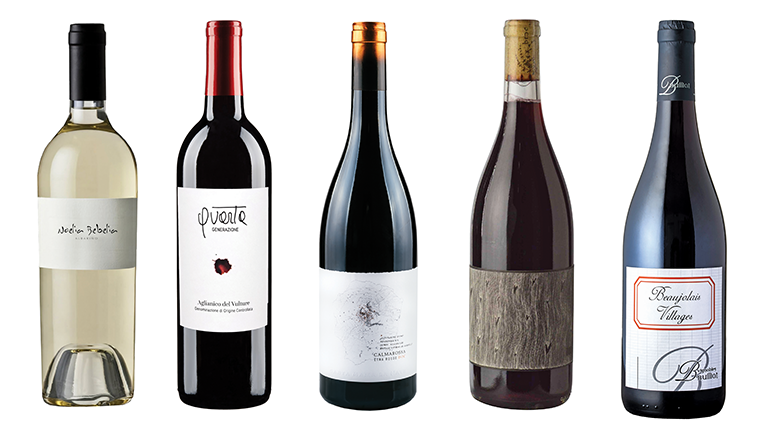 These wines would also make great gifts for holiday hosts. “I like to go with a light red,” Evans says. For bridging the unpredictable Thanksgiving pot-luck gap, he recommends the fruity Broc Cellars Love Red blend ($14.99) made from carignan, syrah and valdiguié varietals. He also suggests trying organic Bulliat Morgon Beaujolias ($23.23) from France. As one of the state’s earliest champions of bringing more hard ciders to Utah, it’s no surprise Evans finds cider a great option for holiday sipping. “Try a simple and fresh Washington hard cider infused with lemongrass that is new to the Utah shelves: Incline Lemongrass Cider at $2.28 per can,” he suggests. For a flexible white, Evans says it doesn’t get better than Portugal’s famed vinho verde. “It’s really delicious with everything on the table at a traditional Thanksgiving meal.” His picks are also affordable options if you’re pouring for a crowd: Covela Avesso ($12.99) and Mica ($10.98). “Whether your vinho verde has a spritz or not, the mineral qualities, light body and limey acidity are just what your tummy needs with such a large meal,” he says.